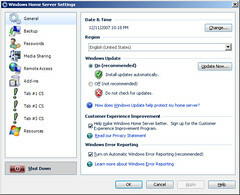 Under the current tab model we are familiar with... the Home Server Console looks for a class named HomeServerTabExtender in a namespace based on the name of the assembly (ie HomeServerConsoleTab.MyTab.dll holds Microsoft.HomeServer.HomeServerConsoleTab.MyTab) for information on the display of a given Console add-in. As simple as this system is, it is extremely limiting as it means that an assembly can only contain a single tab, which leads to multiple assemblies being required for a more complicated add-in that might require multiple tabs (such as in Settings), ITabExtender changes that. ITabExtender defines a read-only property named Next which returns another ITabExtender, enabling a programmer to create a linked-list of add-in tabs with remarkable ease. Note: You are free to create your lower classes/tabs anyway you like, I prefer sticking to the same conventions and constructors as in the parent tab for simplicity. A word of warning though... do not have an ITabExtender refer to itself... or have any kind of circular dependency in your tab set as it will run indefinitely and cause the Home Server Console to take quite a while to load as it waits for your add-in to fail. ITabExtender and it's Next property enables programmers to easily define multiple tabs in a single assembly, offering the opportunity to visually break one large and complicated add-in into smaller and more manageable sub components that can each be represented by their own tab, keeping in mind the whole while that the Windows Home Server Console only supports a finite number of tabs.